Anchorage Memories VIP Gift - get your free VIP magazine by email each month and get your free downloadable Alaska short story! You'll love this free, instant downloadable story about when Mike of Anchorage Memories, and his brother Tom went camping when they were teenagers on a small, remote island in Alaska. And how their imaginations ended up making them pack up and run for home. Your's free when you join Anchorage Memories Magazine. On the first Sunday of every month, you'll enjoy nostalgic stories and pictures about Anchorage days gone by. And you'll learn more about Alaska when you read our "Alaska Nugget" short facts about the Great Land. Plus, you get your free Anchorage Memories VIP gift when you join. We only ask you for the information we need to send you our Anchorage Memories VIP magazine. Your first name and your email address. Your information goes to Mailchimp, the company that sends out our magazine. But to no one else. It's also protected by European General Data Protection Law. And in every edition of Anchorage Memories VIP, there is a link you can use to unsubscribe completely. And we never give your information to anyone. Lots of emails crowding your inbox everyday. We know how annoying that is! "Hard Sell" messages. You don't need those things. Spam. (Alaskans like the edible kind) But who needs email spam? We never invade your privacy. We will never, ever sell or give away your email address or any other information to anyone else, ever. Join Anchorage Memories VIP and you'll enjoy nostalgic memories of Anchorage and Alaska days gone by. All you need to do is enter your first name and email address below. 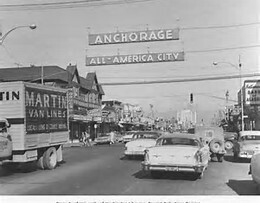 and Anchorage was named an "All American City"
We'll see you in our next edition of Anchorage Memories VIP.